OSS III pays out record $1.17 Million………. Online Super Series III Pays Out a Record $1,176,445 in Prize Money With Player “Sandymar” Finishing 1st in the Leaderboard. San Jose, Costa Rica – April 8, 2014 – It’s not just the upcoming LSOP Millions II that has online poker players excited about the concept of a million bucks. 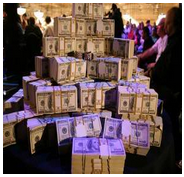 Leading online poker site Americas Cardroom today announced that its $900,000 online poker series paid out nearly $300,000 more than what had been guaranteed, handing out a record $1,176,445 in prize money. 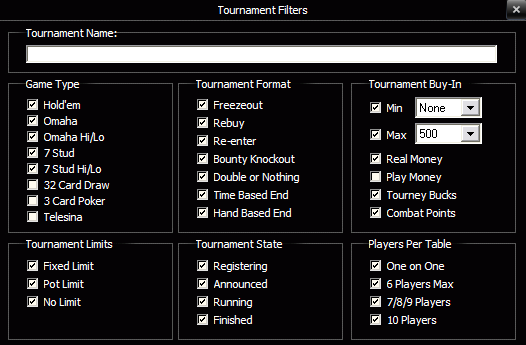 From March 28th to April 6th, Americas Cardroom had guaranteed $900,000 in over 63 separate online poker tournaments. Buy-ins for the tournaments ranged from just $0.52 to $530. 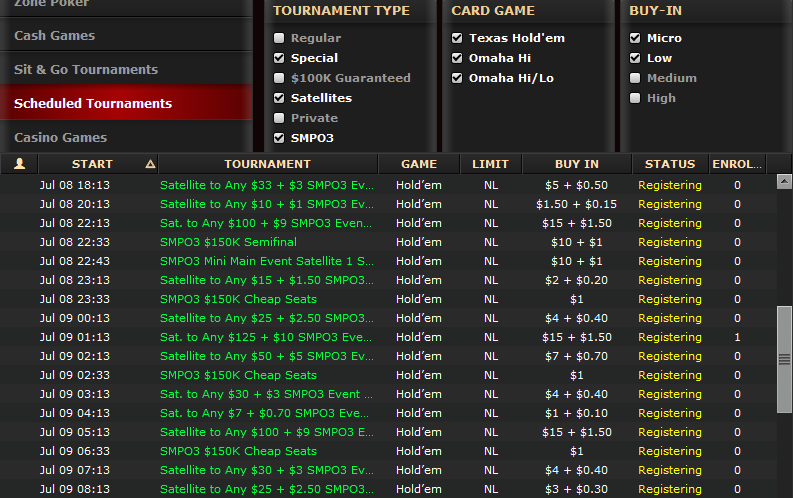 Available tournaments included no-limit and limit Texas Holdem, Omaha Hi/Lo and Pot Limit Omaha events. OSS III also offered a Championship Leaderboard. Poker players earned points for each event played and ranked on the leaderboard. “Sandymar”, the first place winner, walked away with bragging rights, the OSS III title, and an all-expense paid luxury trip to the 2014 Punta Cana Poker Classic. 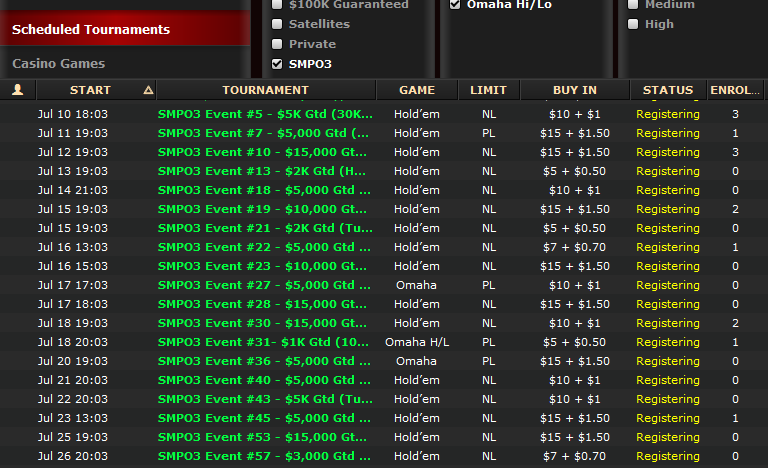 With the online poker tournament series wrapped up, all eyes are now focused once again on LSOP Millions II. Americas Cardroom has revealed that they will be sending players to the second installment of the land-based tournament, scheduled for this September. While the LSOP Millions was originally slated to be an annual event, the success of the tournament has prompted to organizers to head back to Panama just six months after the inaugural tournament wrapped. While OSS III has ended, online poker players don’t have to wait long to play in a large poker tournament. Every day, Americas Cardroom hosts The Big 10, a packed schedule of guaranteed poker tournaments with interesting and over lay ridden prize pools. The online poker site, Americas Cardroom will be hosting a $100,000 Guaranteed tournament this Sunday April 13th at 7:00pm EST. More information on the OSS III results can be found at AmericasCardroom.eu. Online Poker Update reachs 20,000 hits……. It happened last evening, this website hit the 20K mark in readership…..
Now a days, that doesn’t seem like a big deal, but for our little part of the web it is huge……. We don’t have the flash, we don’t have the big names, the celebrities, all we have is you………………..
We’re the regular guys (and gals), the average every day guy, the hard working put in long hours guy, the tax paying never seem to get ahead type of guys. We are the players who love Poker and want to play as often as possible, sometimes we win, sometimes we lose, but we always have a great time trying………. Most of all, we’re your friends, co-workers and neighbors next door who manage to find all the things Poker (the best deals) we’re all looking for……………..
All we look for is a way to enjoy our free time, play some cards and maybe win a couple of bucks here and there. Here at Online Poker Update, we will continue our promise to keep you up to date on all the best places to play, find you the best deals and make your Poker dollar go a little farther and hopefully make you a winner………. 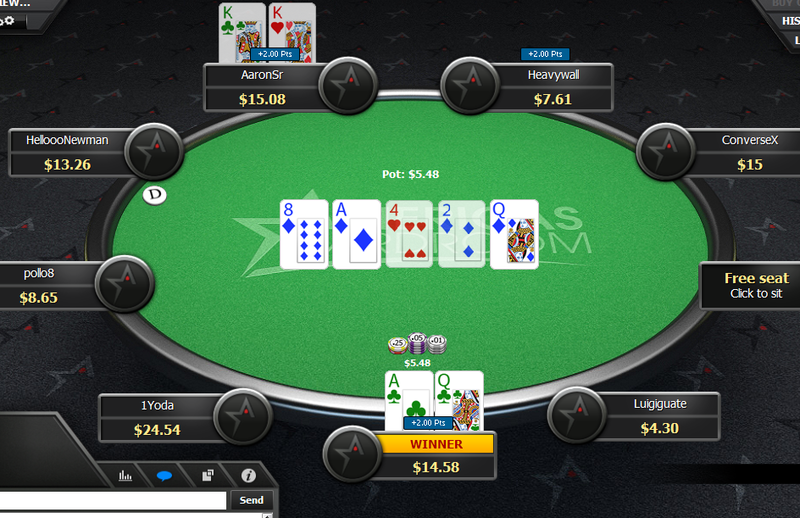 The High Five Tournament series on ACR is a Hit…. Can You make to the Final Table? At 3PM Wednesday afternoon the first card was dealt on the $3.30 buy-in $1800 GTD. As the evening progressed it became very apparent that Every event would exceed the expected guarantee. Total High Five pools totaled $67,038 for day one, exceeding the posted Guarantees of $49,800 by $17,238. Visit ACR and get playing on the High Five before it ends this Sunday………. 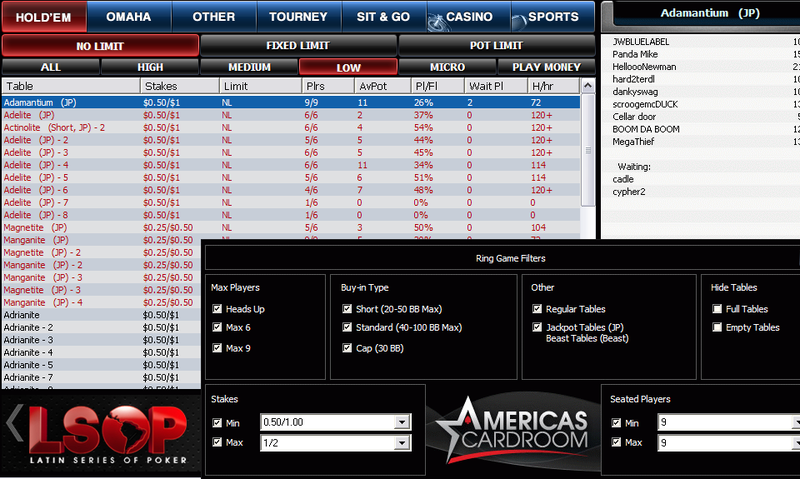 There has been a dramatic player traffic increase on the Winning Poker Network, namely Americas Cardroom this month. ACR and the Winning Poker Network recently launched a significant software upgrade, taking the software to a new level and answering the many requests from players to improve the play experience on ACR. If you haven’t seen the recent TV spots for ACR on the national TV coverage of the WSOP, your not watching much poker are you? ACR has been running ads for their Free Play Site: AmericasCardroom.net 2 or 3 times a evening since TV coverage has begun. The Beast Anniversary Celebration has been paying cash out daily to the ring game grinders who accumulate the most Daily Beast Points everyday in August. $1000 is paid daily and a $5000 weekly award is also paid. ACR has the Best Guaranteed Tournaments Daily including the nightly $10K where a $27.50 buy-in gets you into the largest guaranteed tournament scheduled every night. San Jose, Costa Rica – August 14, 2013 – As The Beast Anniversary celebration continues this month at Americas Cardroom with daily $1,000 leaderboard competitions and three more weekly leaderboards worth $5,000 a piece, poker players from all over the US are signing up to take advantage of the cash giveaway in record numbers. 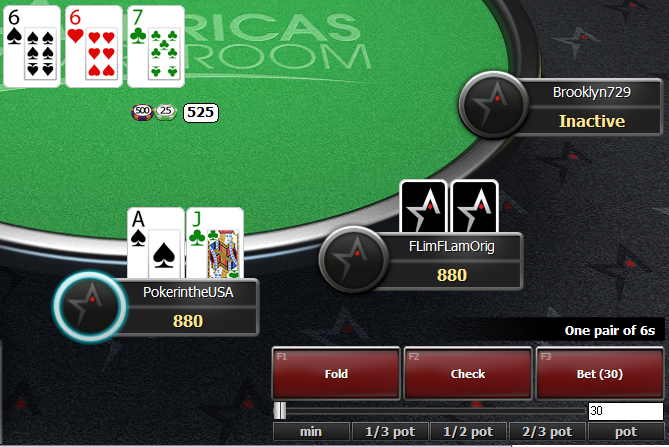 Earlier this week, Americas Cardroom became one of the big three online poker sites in the US. 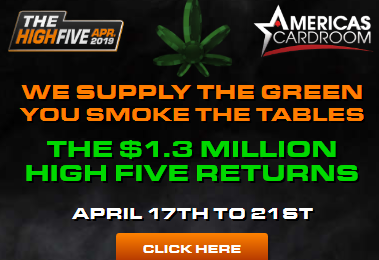 The Beast is Americas Cardroom’s progressive points race that’s funded entirely through the poker site’s jackpot tables, using players’ shared jackpot contribution money. Anyone who sits down at a cash table marked Jackpot automatically becomes part of The Beast competition by earning points through participation in a raked hand. At the end of each month, the prize pool in The Beast is distributed to players who rank on the Beast leaderboard. But for the month of August, Americas Cardroom has upped the ante with an additional $51,000 in prize money, handed out through 35 additional leaderboard competitions. That’s on top of the already popular monthly competition. The 35 competitions come in the form of 31 separate $1,000 daily leaderboard competitions and four weekly $5,000 competitions. The daily and weekly leaderboards are not cumulative, so everyone has a shot at winning. Each daily leaderboard resets at midnight to give all players a fresh start. The weekly leaderboards run from August 1-9, August 10-16, August 17-23, and August 24-31. Each leaderboard resets at midnight each start date. 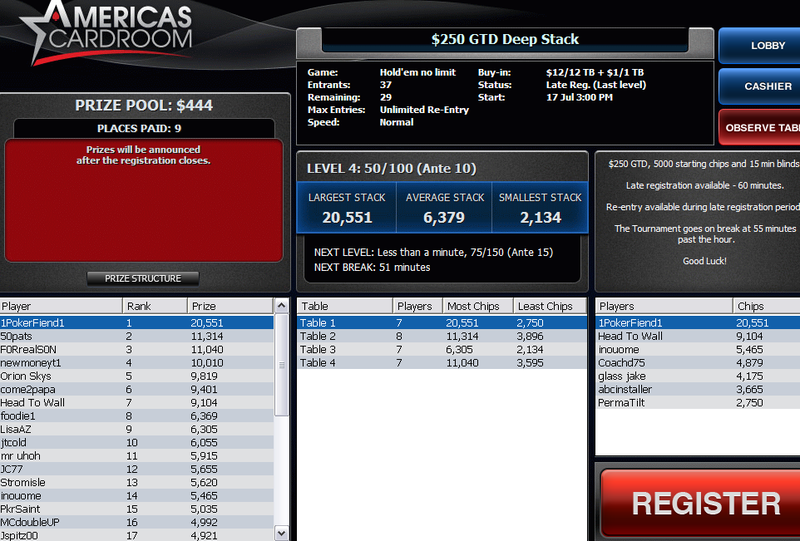 While many poker players are profiting large from the giveaway, DULT, THEREALTREENOM, CELLAR DOOR, and N0TS0GRACI0US1NDEFEFEAT have stood out with multiple daily leaderboard appearances. The Beast Anniversary, coupled with dramatically enhanced online poker software, has meant a large increase of traffic at Americas Cardroom. Last week, Americas Cardroom overtook Merge to become the third-largest US-friendly online poker room. As the Beast Anniversary celebration continues, many online poker experts are predicting that Americas Cardroom will narrow the gap between the #3 and #2 spot. WINNER-TAKE-ALL THIS WEDNESDAY; a $100 MULTI-TABLE Poker Tournament! There is a crisp $100 bill waiting for the player who holds all of the chips after the last hand is played. Bring your poker face and nerves of steel because there are no points for second place. You want to finish in the money? Don’t Lose. My Best Poker Buddy is going to the World Series……. It’s that time already, the 44th annual World Series of Poker® is just around the corner! I have a Poker Buddy who has already bought into (won a satellite) the June 7th $1500 HORSE Event at the Rio…………..
Can You make it to a Final Table? Says if he cashes enough on either, he’ll stay for the $5000 buy-in PLO hi-lo/8 better Event on June 13th. He plays every chance he can (weekly, when possible) at a local poker room, and has won that $1500 seat on a satellite. I know him well, I guarantee he”ll try a few ring tables to get the feel of Las Vegas Poker and the atmosphere that will be rampant there at that time. He has told me, he will play a few WSOP satellites while in Vegas, and see where it takes him. He’ll win something…….I know it! His style is completely different from my own way, I’m cheap and basically tight/aggressive….. He is a outstanding Live Omaha hi-lo 8/b Player, and is determined to be at a final table and on TV. From me, and all my readers: Good Luck, Rod……………………. Last year World Series of Poker® payouts totaled over $222 Million with over 74,700 players competing on 61 Tournaments, this year will see 62 events and even more paid out. The 2013 Event is planned to be bigger and better than ever, there are plans to spread over 480 tables this year and a couple of new twists have been added, like re entry tournaments which are planned. A re entry tournament is where you can re-enter the same tournament after you are eliminated. There is a time limit (within the 1st 4 levels) on when you re enter, just like a re-buy tournament. These Re-entries should bolster the pools dramatically and make make it another Record Payout year. There is also a turbo tournament planned, where the levels at the beginning are set at to play quicker than the later levels. Level 1 to 4 are 30 minutes, level 5-17 are 40 minutes and all levels past 17 are 1 hour. 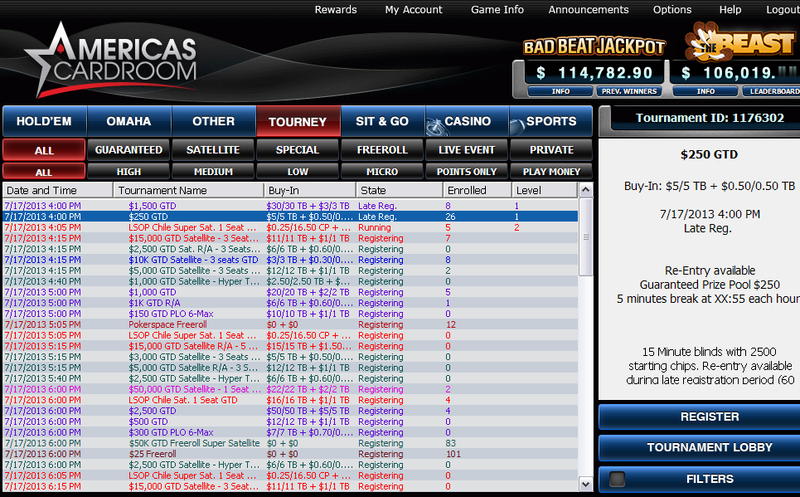 The Little One for One Drop, (unlike last years $1million buy-in) has only a $1111 buy-in ($111 donated to One Drop). This means just about everyone can join in, not only helping a very honorable cause, but compete in what looks like will be a very huge tournament pool (unlimited re-entries), my guess would be at least, if not over, a $1 million pool (just 1000 total entries, no problem)……. Like always, there will be a tournament to match your skill sets. These include 4 max NLHE, 6 Max NLHE, 8 max NLHE, 2-7 low ball, Omaha, PLO/8b, 7 card stud, 7 card stud /8b, Razz, eight game mix, 512 player NLHE heads up, a 2000 player shoot-out, ante only NLHE, ladies only event, senior only event and others. $1 Million GTD “Millionaire Maker” with just a $1500 buy-in on June 1, 2013. This is single re-entry tournament with the winner being guaranteed a $1 million prize. World Series of Poker (WSOP) and its related trademarks are owned by Caesars Interactive Entertainment, Inc.
InfinitiPoker is inviting Players to join them for Beta Testing. Notice: If you have already installed the Infiniti Poker software, please first un-install the current version on your computer through “Control Panel > Add/Remove Program” and re-install the new download. We at Infiniti Poker would like once again to thank you for subscribing to our newsletter and would now like to take this opportunity to invite you to participate in our very first public Beta Test Program. It is our intention to release a world class product and game room and therefore your participation and input will be a key component in assessing the strength and quality of our software offering. The lobby will contain multiple game room options that will be open 24/7 over the next several weeks. Be aware that at this time, we will only be testing No Limit texas Hold’em. Feel free to play at your own leisure and, most importantly, let us know what you think! Upon finishing your gaming session, you will be prompted and encouraged to provide feedback as to your impressions of our software platform. Remember that your valuable insight will provide us the guidelines needed to perfect our product to your specification. Have fun and we’ll see you at the tables! We went to Infiniti and followed the instructions and downloaded their software with no problem (we are on a windows platform). We were on at 9AM Sunday morning, and didn’t see any players (reports on some forums state traffic, is light so far). Since we didn’t play we can’t can’t comment on the software. However we like the look and there have been many nice compliments written, as soon as we play we’ll let you know what we think. It looks like this will be a real money room, based on the Account/Cashier page, but we cannot say for sure. Visit Infiniti now, sign up and give it a try……InfinitiPoker will welcome any comments or questions and you just may have some input on how Infiniti develops. We also believe beta testers just may be rewarded in some small way.